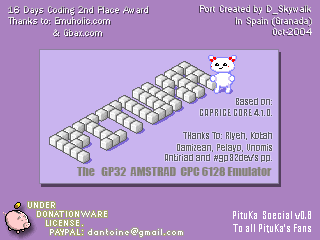 The first and only Amstrad CPC Emulator. Needs the game roms to play. A MAME emulator supporting over 700 old arcade games! You can also download the sources here. 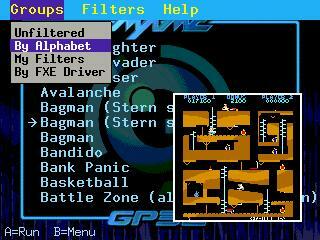 An alternate Frontend for MAMEGP with the possibility to filter games and display screenshots. This is the normal version. Get the BLU+ version here. This is the BLU+ version, get the normal version here. Pictures for the MAMEGP Alternate launcher (100x100 resolution). Pictures for the MAMEGP Alternate launcher (125x125 resolution). Emulates the Arcade game Phoenix. 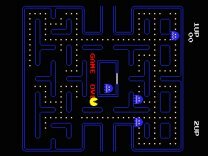 Enter Robs Multiple ARCADE emulator, which has been designed from the ground up to emulate more than one machine, with the first version aiming to include perfect emulation of Space Invaders, Space Invaders Part II, Pacman and Donkey Kong. ported by Kevin Sangeelee, Nov 2003. Plays the arcade game Space Invaders. Arcade emulator supporting 15-20 games. Port of the Lynx Emulator for the GP32. Port of handy, the Lynx Emulator. You can also download the PSP version here. If you have a BLU+, get the right version here. If you're having a normal GP, get it here. A Chip 8 emulator. Most games except Tetris should work. Colecovision Emulator. Fullspeed with sound. PlusIVe is an emulator of the classic Commodore Plus/4 home computer.